Brooklyn Nine-Nine is an American sitcom on NBC which centers on a police precinct in Brooklyn, New York. The show stars Andy Samberg as Detective Jake Peralta, a talented but immature detective whose free reign at the 99th Precinct comes to an end when a by-the-book captain takes over. Brooklyn Nine-Nine is in its sixth season and now airs on NBC. The network recently renewed the show for a seventh season to air in 2019/20. Andre Braugher stars as Raymond Holt, who battled adversity and discrimination to work his way up through the ranks of the NYPD to finally become captain of a precinct. Holt's unemotional style clashes with the Peralta's immature ways, though they are both committed to their police work. Helping Holt command the precinct is Sergeant Terry Jeffords, played by Terry Crews, a body builder who is just as devoted to his wife and two young girls. Terry is back on the front-line after a traumatic incident led to him being put on desk duty. The precinct's squad includes Amy Santiago (Melissa Fumero) an uptight, by-the-book detective who is enamoured with Captain Holt and continually strives to please him. Detective Rosa Diaz (Stephanie Beatriz) is equal parts smart and tough, and rarely lets the other detectives in on her personal life. Detective Charles Boyle (Joe Lo Truglio) is a hard-working detective who isn't physically gifted. Veteran detectives Norm Scully (Joel McKinnon Miller) and Michael Hitchcock (Dirk Blocker) don't bring much to the table with their police work, though they do make a great cup of coffee. Gina Linetti (Chelsea Peretti) is the precinct's sardonic administrative assistant. Though she sometimes hides behind a clueless attitude, she has been known to be surprisingly observant and more intelligent than she wants to let on. Brooklyn Nine-Nine premiered on FOX on Tuesday, September 17, 2013. On October 18, 2013, FOX picked the show up for a full season of 22 episodes, and later gave the show a coveted post-Super Bowl time slot with New Girl. After only a few months on air, Brooklyn Nine-Nine won two Golden Globes on January 12, 2014 with Andy Samberg winning the Best Actor - Television Series Musical or Comedy award, and Brooklyn Nine-Nine winning the Best Television Series - Musical or Comedy award. Andre Braugher won a Critics' Choice Award for Best Supporting Actor in a Comedy for his role as Captain Holt, while Andy Samberg also won an American Comedy Award for TV Comedy Actor. FOX renewed Brooklyn Nine-Nine for a second season on March 7, 2014. FOX moved the show to Sunday nights for its second season, airing along side their stable of animated comedies including The Simpsons, Bob's Burgers and Family Guy. 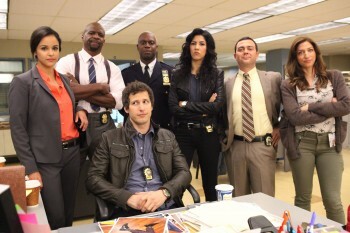 In January 2015, FOX renewed Brooklyn Nine-Nine for a third season. Brooklyn Nine-Nine's third season premiered Sunday, September 27, 2015 on FOX and aired its season finale on April 19, 2016. In March 2016, FOX renewed Brooklyn Nine-Nine for a fourth season. Brooklyn Nine-Nine's fourth season premiered on Tuesday, September 20, 2016. Brooklyn Nine-Nine was renewed for a fifth season by FOX in May 2017. The show was moved to the later time of 9:30/8:30c on Tuesdays for its fifth season, which premiered Tuesday, September 26, 2017 and aired its fall finale on December 12, 2017. 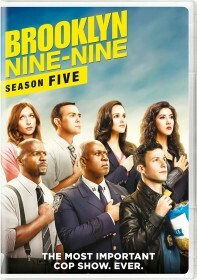 Brooklyn Nine-Nine aired its milestone ninety-ninth episode during the fifth season. FOX moved Brooklyn Nine-Nine to Sunday nights at 8:30/7:30c from March 18, 2018. The fifth season finale will air Sunday, May 20. In May 2018, FOX announced it would not be renewing Brooklyn Nine-Nine for a sixth season. Just days later, NBC announced it was picking the show up for a 13-episode season to air mid-season 2018/19. NBC is the sister network of Universal Television, the studio behind Brooklyn Nine-Nine. Chelsea Peretti revealed in October 2018 that she would not be a series regular in the sixth season. In September 2018, NBC upped its order for Brooklyn Nine-Nine's sixth season to eighteen episodes. The sixth season premiered on NBC on Thursday, January 10, 2019. In February 2019, NBC renewed Brooklyn Nine-Nine for a seventh season to air in 2019/20. The network did not reveal how many episodes it had ordered.